First Out is Leicester Lesbian Gay Bisexual and Trans Centre’s social and support drop in group for young people aged between 13 and 19 who identify as lesbian, gay, bisexual, transgender or are questioning their sexuality or gender identity. The group is free to attend and you do not need to book in advance. TIME: Every Thursday evening from 06:30 PM - 08:30 PM. WHERE: Leicester LGBT Centre, 15 Wellington Street Leicester LE1 6HH. ACTIVITIES: Help with coming out or homophobic bullying. Organising community events. BBQs. Social evenings at the Centre. Cinema trips. Games nights. Pool matches. For more information about the group, please call 0116 254 7412 or submit a request on the Contact Us form. Living Out Loud is a social and support group for individuals who identify as transgender or who are questioning their gender identity over the age of 18. WHERE: Leicester LGBT Centre, 15 Wellington Street, LE1 6HH. Leicester LGBT+ younger-adults is a social group for anyone between the ages of 18 to 30 years. The group is a great opportunity to socialise and meet friends with other LGBT+ young adults, as well as sharing support and advice. TIME: The group meets on the second and fourth Wednesday of each month, from 07:00 PM - 09:00 PM at the Leicester LGBT Centre on Wellington Street. Come along to find out about the group. If you would like more information get in touch! The T-Party is the Leicester LGBT Centre's social and support group for young people aged between 13 and 19 who are trans, non binary or questioning their gender identity. TIME: Every Monday 06:00 PM - 08:00 PM. The group meet from 7:30pm every Wednesday night at either the LGBT Centre (15 Wellington Street, Leicester LE1 6HH) or at venue around the city centre. Rubyfruit Women is a social group for all lesbian, bisexual and questioning women. We welcome new members so please feel free to come along and join us. We have organised activities such as meals out, quizzes, bowling, craft nights and barbecues in the summer. Some Wednesdays we just meet up at the centre for a cup of tea and a chat. We also organise occasional Women Only discos. Rubyfruit Women is a volunteer run, non-profit making organisation and is free to join/attend. Depending on the event there may be a small charge to cover costs. No volunteers benefit financially from their involvement with Rubyfruit or any of it’s activities. Any money made is spent on promoting Rubyfruit Women and financing further activites. TIME: 1st & 3rd Wednesday of each month from 07:00 PM - 09:00 PM. WHERE: Leicester LGBT Centre, 15 Wellington Street Leicester LE1 6HH and other locations. EVENTS: To see information about our events click here. You can contact us by email or call/text Rachel on 07396075551. We’re also on Facebook . Let us know if you want to join our mailing list. Alternatively for more information about the group, please call 0116 254 7412 or submit a request on the Contact Us form. Silver Sipp-ers is a social group of older lesbian, gay, bisexual and transgender people who meet in a friendly environment. Come in for a cup of coffee, tea and a chat! TIME: First & third Wednesday of each month at 10:30 AM – 12:30 PM. Strong Ties is a social and support group for family members/partners of somebody who identify as transgender or who are questioning their gender identity. TIME: 2nd and 4th Thursday of each month from 06:00 PM to 08:00 PM. WHERE: Leicester LGBT Centre, 15 Wellington Street, LE1 6HH. For more information, please click here. Free to Fly is the new group for LGBT+ refugees and asylum seekers. This group is a social and support group. TIME: Every Thursday from 01:30 PM - 04:00 PM. WHERE: Leicester LGBT Centre, 15 Wellington Street, Leicester, LE1 6HH. We welcome new members so please feel free to come along and join us. The Wildecats is Leicester’s only LGBT football team. It was the formed in August 1996 and quickly became one of the most successful LGBT teams in the country. The Wildecats players are from various age groups, and the members are mostly LGBT, but straight friends and family members also participate. New members are always welcome to join in the kick-abouts. If you are interested, you can either send an email to Gareth or Steve or if you prefer, just come to one of the kickabouts. For more details click here. TIME: Tuesday 07:30 PM 09:00 PM. WHERE: St Margaret’s Pastures, Leicester. For more information, please contact Gareth, Jeremy or Steve by clicking here. Eating OUT is a new Lesbian Dining Group based in Leicestershire. We meet and eat about once a month in the evening. Dates to be announced about 3-4 weeks before. We aim to provide a venue that has a fixed price Menu (with choices for all dietary requirements). A £5 deposit would be needed in the run-up to the date so we can book you in, we will take the deposit off your bill at the end of the night. You only pay for your own food. We keep the drinks separate. We are friendly and welcoming. If you are new and don't know anyone please come alone. If you’re interested and would like to be added, please head to our Facebook Group. Leicester Gay Group is one of the longest running social groups in the country for gay and bisexual men, having started in 1972. Currently we have around 25 members of varying ages and backgrounds. We are very much a network of friends meeting up about 3 to 4 times a month in and around Leicester to share in a variety of activities. Past events have included meals out, talks, films, walks, pubs, social gatherings in members’ homes (such as our ever popular Pudding Evening), quizzes, garden parties, picnics and skittles. Most of the time we don’t organise events on the scene. We welcome new members to join us. As a first step we like you to meet with a couple of our members for a chat in a local pub. We find that this helps to break the ice. We have an annual membership fee of £12 a year waged and £6 unwaged, but you can come along to a couple of meetings first to see if you like us. EVENTS: Click here for a list of events. You can contact us either by e-mailing Pete or by calling us on 0116 291 6138. 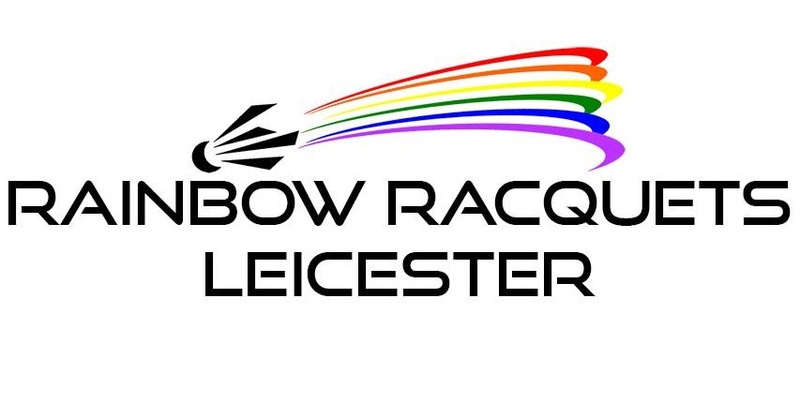 Rainbow Racquets is a social racquet sports club for the LGBT community and friends in Leicester. Our focus is primarily on regular badminton sessions, and we have players of all levels of ability - from complete beginners to experienced players. We are keen to encourage Leicester locals (and visitors!) keen to play some sport, socialise, meet some new people and have a bit of fun. New players are always welcome to come along and play at our regular badminton sessions and we're also keen to encourage others to meet up for tennis and squash. Playing is free for Leicester City Council Leisure Centre members and approx £5.00 for non-members (payable directly to the Leisure Centre on arrival). The focus of these evenings is social. Players of all standards are most welcome. We have a few loan racquets for new players, so you can't use that as an excuse not to join in! We also try to head out for a cheap and cheerful bite to eat after playing from time to time.